Nikki Kreuzer has been a Los Angeles resident for almost 30 years. When not working her day job in the film & TV industry, she spends her time over many obsessions, mainly music, art and exploring & photographing the oddities of the city she adores. So far she has written over 100 Offbeat L.A. articles which are published at the Los Angeles Beat and on the website OffbeatLA.com. As a writer she has also been published in the LA Weekly, Oddee.com, Blurred Culture, Twist Magazine, Strobe and Not For Hire. Nikki is also a mosaic artist, working actor and published photographer. Her photography has been featured in the print version of LA Weekly and as part of an exhibit at the Museum of Neon Art. In the band Nikki & Candy, she plays bass, sings and is co-writer. Find Nikki & Candy music on iTunes, Amazon or at NikkiandCandy.com. Nikki is currently working on her first novel. Please "like" the Offbeat L.A. Facebook page! For more Offbeat L.A. photos & adventures follow @Lunabeat on Instagram or @Offbeat_LA on Twitter. 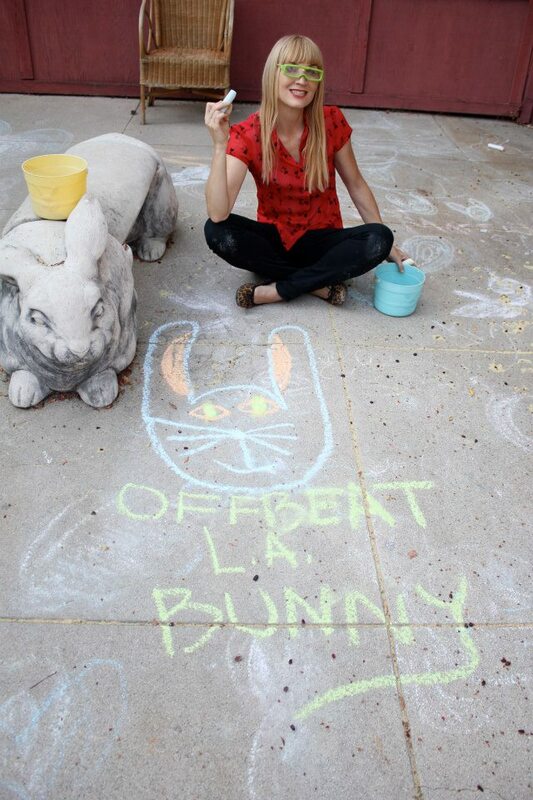 This entry was posted in Attractions, Interviews, Miscellanious, Offbeat LA, Videos and tagged Bunny Museum, Nicole Kreuzer, Nikki Kreuzer, Offbeat L.A., Offbeat LA. Bookmark the permalink. You are so cute when you hop! You actually went there! I lived in Pasadena when I first moved here and was tempted, but I’m scared of giant bunnies. nikki, I am friends with your cousin Dawn. She would post things that she followed you on. They were so interesting, I decided to follow you too…. these things you are doing are so cute and fun. Thanks for what you do, you have so much fun that when we read or view them, it brings you back to simpler times. Great job. Keep up the good work.